Nothing says autumn like a big pile of orange pumpkins! This is the time of year when those beautiful gourds are ubiquitous: they’re on front porches, in giant crates at the grocery store, and brightly adorning roadside farm stands. Everything is pumpkin flavored too, but I have to admit that I find that rather less refreshing. Pumpkin flavored stuff usually doesn’t have an ounce of pumpkin in it – it’s all about the spice blend used. It’s all good and well if you love the taste of nutmeg and cloves, but real pumpkin deserves some attention too. While carrots usually get all the credit for providing beta carotene, pumpkins are also high in the nutrient. Beta carotene is important because your body converts it to Vitamin A. Vitamin A is important for eyesight, your immune system, and healthy skin. Plus, pumpkin is full of fiber. It can be hard to find foods that taste good, are low-calorie, and have fiber, too. Pumpkin fits all three of those requirements! Pumpkin seeds are also incredibly healthy; they contain zinc, fiber, magnesium, protein, and more. When you stop to think about all of the nutrition you can find in a simple pumpkin, you’re going to wonder why you’ve been using this superfood solely as a porch decoration for so long. While there are several ways to eat pumpkins, I find the simplest way to start is to turn it into a puree. It’s a simple process, and at the end of it you’ll have plenty of pumpkin puree to store in your freezer for the coming months. Did you know that there are dozens of varieties of pumpkins? It can be overwhelming to choose the best type to preserve. Technically, you can use any variety of pumpkin that you like, but some are certainly better than others. 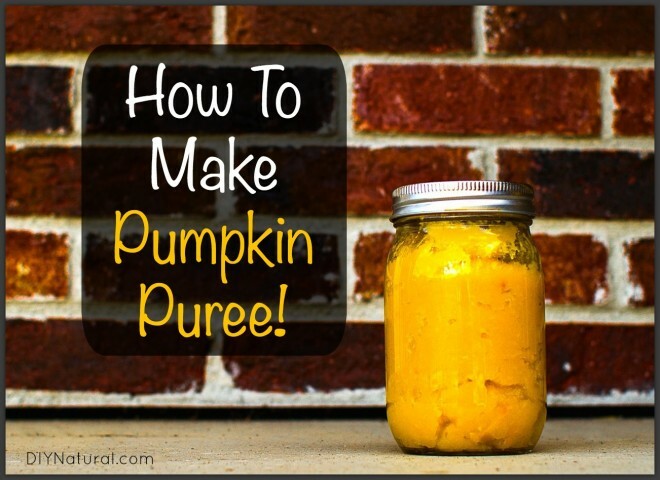 Smaller pumpkins tend to be sweeter, and therefore make tastier purees. These are often referred to as pie pumpkins. If you’re going to grow your own pie pumpkins, look for varieties like New England Pie, Sugar, or Baby Pam. 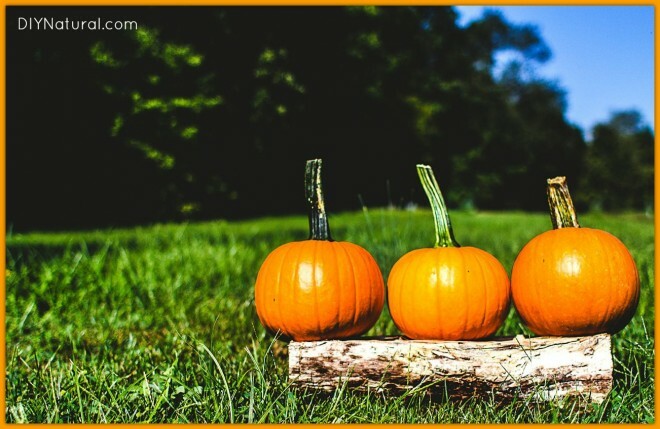 Growing your own pumpkins is fun and rewarding, but if you don’t have garden space or your crop doesn’t turn out, you’ll have to look elsewhere. This year we bought ours at our local farmer’s market. Pumpkins are not always labeled by variety, so we just looked for the healthiest small pumpkins we could find. Pie pumpkins are smaller, rounder, and have longer stems than jack-o-lantern pumpkins. So you know how many to buy, keep in mind that I used five pumpkins and ended up with a gallon (16 cups) of pumpkin puree. It’s probably a good idea to start out with two pumpkins if this is your first time. Once you have picked or purchased your pie pumpkins, you’re ready to turn them into puree! 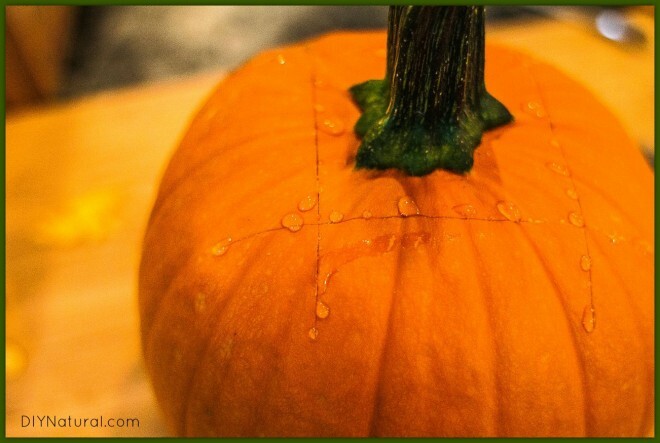 After your pumpkins are washed, cut them into rough quarters. My favorite method is to cut down, from top to bottom, leaving a square around the stem. The pieces aren’t quite even, but it’s easy to cut that way, and you’re left with most of the waste in the middle. That’s less scooping for you! Be prepared: this is a fairly time-consuming, messy process. Make sure you rinse your hands frequently because slippery hands and big knives do not make for a happy combination. When your pumpkins are quartered and cleaned out, it’s time to put them on cookie sheets. They will drip as they cook, so this protects the bottom of your oven. Put them in the oven and cook them at 350° for 45 minutes or so. You can use the old stick-a-fork-in-it method to determine doneness. Once your pumpkins are baked, separate the flesh from the peel. Put the flesh into a food processor or blender and process until smooth. Depending on how many pumpkins you are pureeing, this may take several batches. Prepare for freezing. You can use plastic freezer bags, but the safest method would be to use glass jars or other glass freezer containers. Decide ahead of time how much you will place in each container. I recommend one cup per container, but you should use whatever safely fits in your container and/or what you foresee to be the amount you will most frequently need. A note when freezing in glass jars: Use canning jars, not recycled glass jars. Canning jars are thicker and less likely to break when food expands as it freezes. To further prevent breakage, leave headroom in your jars so that your food has room to expand upward. I have a feeling that one of the first questions I’ll be asked about this piece will have to do with canning pumpkin puree. I wish it were a possibility to do so, but the USDA recommends against it and has since 1989. The biggest reasons that it isn’t recommended deal with the thickness of pureed pumpkin and the low acidity of the fruit. Those two things combined mean it’s impossible to guarantee that all of the botulism spores will be killed during processing. So, for better or worse, pumpkin purees are relegated to the freezer. How Should I use Pumpkin Puree? What’s your favorite way to use pumpkin puree? I freeze mine in freezer bags too and it’s not an issue. I made pumpkin french toast and they were delicious. I put pumpkin in my beans when I am making rice and beans. It’s delicious. Problem here is they don’t sell pumpkin throughout the year, only during this time of the year. Never heard of this until I moved here. Yuck!!! Why isn’t it safe to freeze pumpkin in freezer bags? I didn’t understand that part. I use pumpkin puree in my dog biscuts. My wife says that if you put 2 Tablespoons of Lemon Juice in the pumpkin puree it will add enough acidity to it so that the botulism is pretty thoroughly negated and from my experience of eating her homemade pumpkin pies the taste is outstanding! I have tried to freeze the pumpkin I cooked and pureed, but the pie I made with it never set. Someone told me that you cannot freeze pumpkin for pie-making as it retains too much water, unless, after thawing, you first pass it through cheesecloth to remove excess water. Have you had any issues with this, or do you just stick with making soups, etc.? Note: I stored it in generic Tupperware, was that the problem? i doubt it was the reason of choosing the container but just that it has frozen water crystals that when you thaw it, will show up and make everything “soupy”. so in my opinion it is just a matter of freezing it and using something like starch to maybe “catch” the water of your thawed pumpkin puree. i “canned” mine years ago, treated it just like applesauce and it works great!! I fill my freezer with food in glass jars. To avoid breakage, ALWAYS chill the food-filled jars overnight in the fridge. Putting a warm jar in the freezer is asking for breakage: the ouside circumference of food will freeze first, leaving a relatively warmer center which will expand as it freezes. Pre-chilling allows for more uniform freezing & expansion. And as the article suggested, always leave headroom. With purees & thick soups I create an indentation in the center, since it is the center portion that will expand upwards upon freezing. One more hint: leave lids loose while freezing. Tighten down only AFTER the food has frozen. Now that I may have confused people, please let me clarify! I read the recipe for making pumpkin pancakes and wanted to know if I could use pancake mix instead of the flour, salt, baking soda and baking poweder? I usually add a couple tablespoons of sugar and about half a tsp of vanilla to my pancake batter anyway. I have used pumpkin pie spice in the past as well as mashed banana’s but my wife doesn’t prefer mashed banana in her pancake or waffle mix so I don’t do that anymore. Since I mentioned waffles, do you make pumpkin waffles in a similar fashion, but add a bit of oil perhaps? Just a question: Can I use good old fashioned store brand or name brand pancake mix in addition to the spices and the pumpkin puree with similar or equal results? Oh thank you so much for this post. I love pumpkin but always afraid of freezing the mason jars. Would you have a recipe for pickled cucumbers? My kids love them, but I don’t want to buy them anymore because all the preservatives they contain :/. I’m almost chemical/preservative free just few things left I haven’t found good subsititution for. What about drying it? Or would you just end up with something that would not rehydrate into anything usable? Thanks! Is there a safe way to can pumpkin? Not the purée, but maybe chunks? I have some room in my freezer, but not a lot. I was thinking- maybe can some pumpkin with chicken or veggie broth for use in soups later? Then freeze some for pies, bars, ect? If the government doesn’t feel it’s safe to can puree, why do they allow companies to sell it in cans in the stores? Also, would you recommend putting it in freezer bags? I don’t know, exactly, but I imagine that companies have more sophisticated equipment to make sure that the temperature reaches a high enough point throughout the entire can of pumpkin. For years I have put mine in freezer bags. I put 1 cup per bag as that is what I use in a recipe. I use it in every way I can imagine and search the internet for more ways to use it. Pumpkin makes a wonderful soup when used with a chicken broth as a base. I’m going to suggest another helpful way of cooking your cutup pumpkins in a crockpot. Add little filtered water on the bottom and steam cook the pumpkin,cool, peel the skins, than blend in the blender. Pour into pint canning freezer jars, which equal to two cups of pumpkin. I make my pies, soup/with bone broth, pumpkin pancakes, pumpkin custard/choc chips, etc..